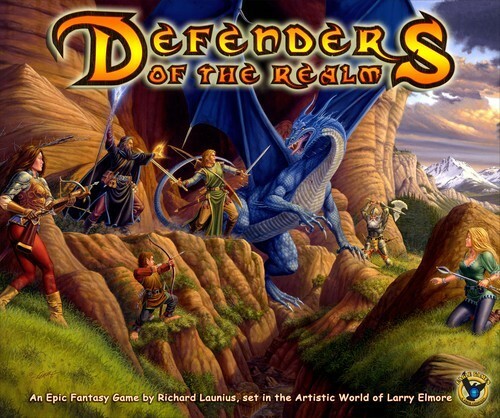 Defenders of the Realm is a co-op adventure in which you take hold of a hero charged with defending your kingdom’s realm from four monstrous generals seeking to invade your beloved Monarch City. 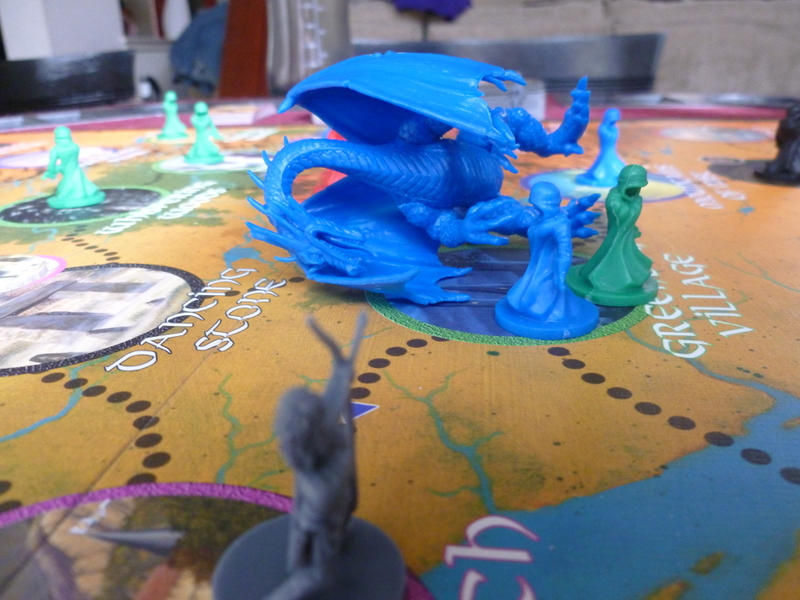 The base game comes with eight heroes (the Sorceress, the Cleric, the Eagle Rider, the Paladin, the Rogue, the Wizard, the Ranger, and the Dwarf) who join forces to take on Sapphire the Dragonkin general, Varkolak the Undead general, Balazarg the Demon general, Gorgutt the Orc general, and their myriad of minions. By juggling your hero’s action points and Hero cards drawn at the end of each turn, you seek to counter the ever-marching generals and prolific minions that also spread at the end of each turn. You’ll probably want to begin by looking over each of the heroes, each of which has a distinct flavor in terms of abilities and playstyle. Whether you choose your favorite or a random hero, you’ll need to grab the matching miniature and your action point tokens. Heroes have 4-6 action points (though these can be modified by abilities and quest rewards) and your hero’s base number is noted by the icon in the bottom left corner of your hero’s card. 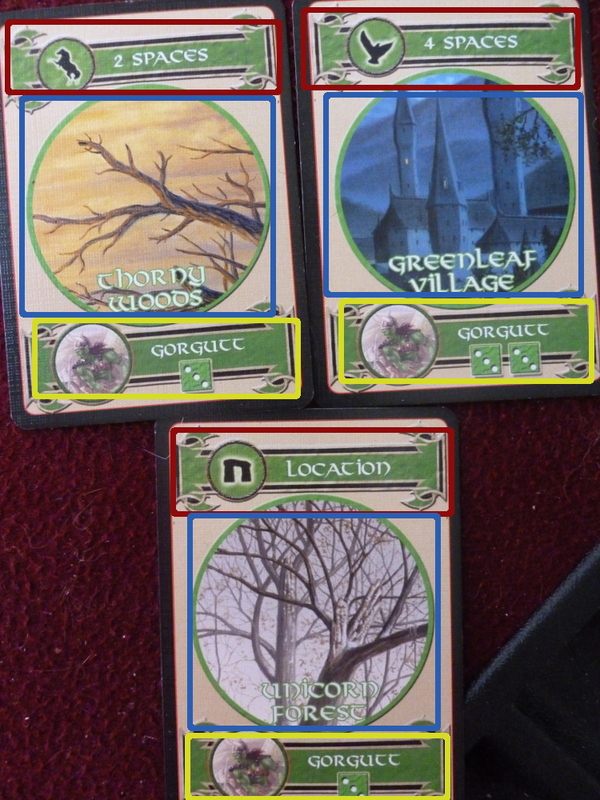 The tokens are useful for noting how many action points you have left on your turn, as well as how much health you have. It can be helpful to turn your tokens over as you go to track how many actions you have left. If you’re hurt, you can place a token to the side of your hero card to denote missing health. 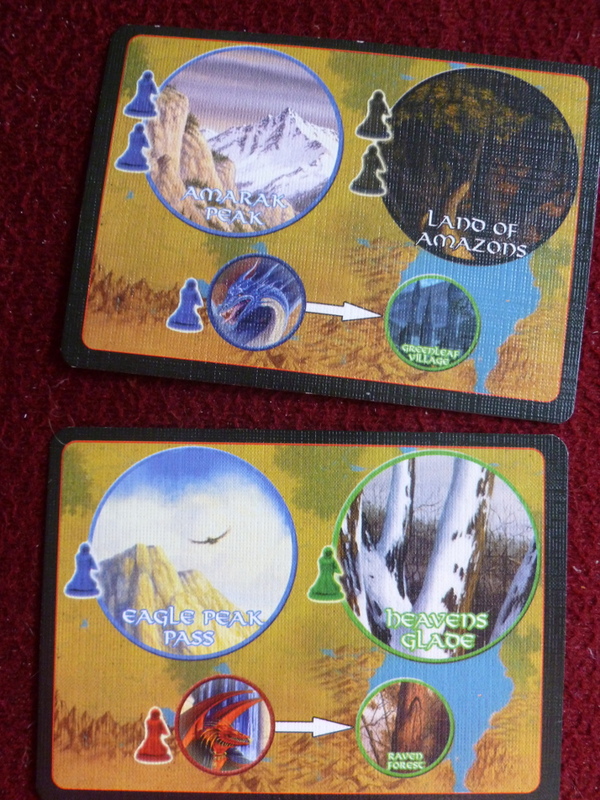 Each player begins with one random quest card and two hero cards. Hero cards can be used for transportation (as a horse, an eagle, or a magic gate), fighting the general listed on the card, the materials for building a magic gate on a matching location, or payment for attempting to clear a taint crystal. Special purple cards serve to provide powerful setbacks for the enemy; as these are removed from the game after use, they should be guarded until their use is absolutely necessary! Some sample Hero cards. There are four colors, one for each general, though only Gorgutt’s are shown here. Red boxes show how cards can be used for transportation. Blue boxes are the locations – by discarding a hero card on your turn, you can build a magic gate if this location matches your current location. Locations also determine where you port to if using the card as teleportation (bottom card – Magic Gate symbol – only). 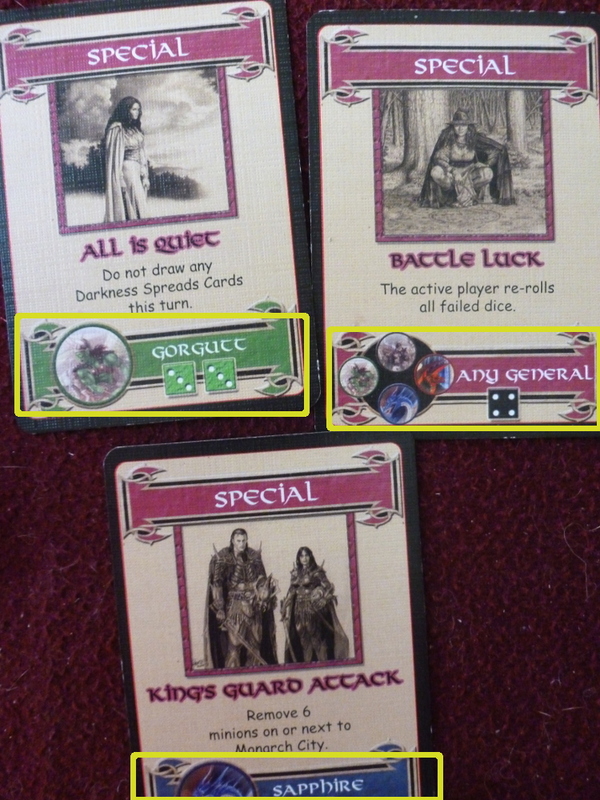 Yellow shows how you can use cards for battle against the generals, giving you one or two rolls to use against them. Once the heroes are in position, you’ll have to populate the enemy’s forces. Place the minis for the generals on their start locations and give them three protector minions each; note that when you give the red demon general, Balazarg, his minions, you also have to add a taint crystal, representing the idea that demons taint the earth more easily than the other races (normally, four minions are required to taint the land). To determine the land’s current enemy count, draw six cards from the dreaded Darkness Spreads deck. Barring special cards and overruns (adding a fourth minion to the space), place two minions on each of the locations of the first three cards and one minion each on the last three cards. Now prepare for battle! 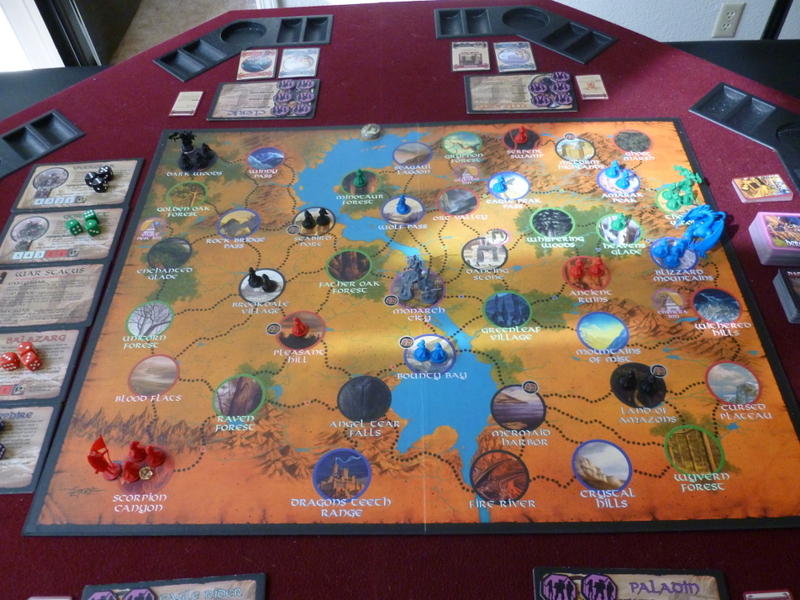 A four player set up. Minions with the generals are set, while all other minion spawns are random. A basic turn consists of planning your actions and doing as many as possible; dice rolls may curtail your initial plans of glory. 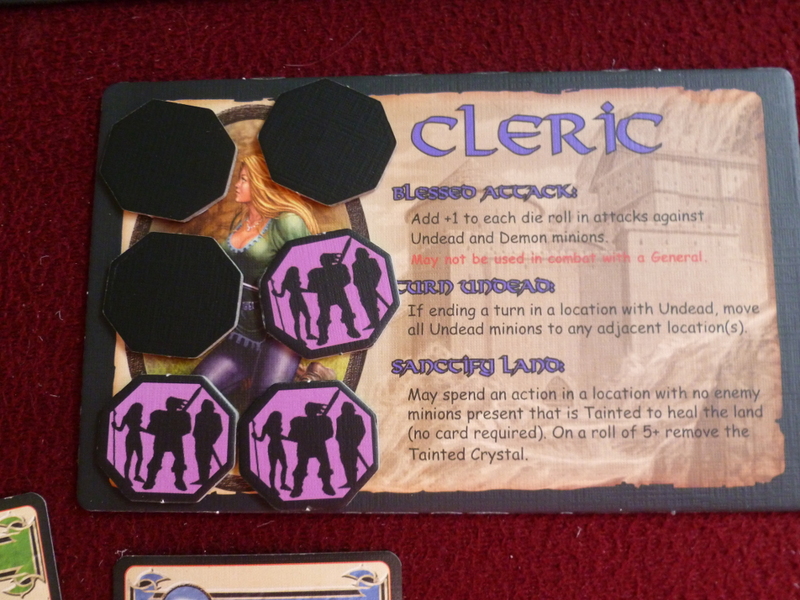 Keeping track using your action point tokens, you can choose to travel, fight minions, listen in at an inn (i.e., draw additional cards), heal yourself, do a quest action, clear a taint crystal, or (after prepared) engage a general. All actions take one action point to complete. If you choose to fight, one action point engages all enemies on the location. You roll separate, color-coded dice for each enemy. If you fail to clear all the enemies, you have to use another action point or move on. If you remain in a space with an enemy at the end of your turn, you’ll take one point of damage from each (one action token) and one point of fear from any undead enemies present. Some heroes can mitigate or negate damage from enemies with their abilities. In general it’s a good idea to avoid taking damage, as missing life points equate to missing actions on your next turn. At the end of each turn, you’ll draw two hero cards and one or more Darkness Spreads cards. In the beginning, only one Darkness Spreads card wreaks its havoc, but as you defeat generals, you must draw more each turn. In mid war (after defeating the first general), draw two cards – the first must be resolved in its entirety, and the second serves only to direct which general moves, if any. In late war (after three generals have gone down), you must draw three cards – the first two must both be totally resolved, while the last directs the general only. Because of this, many minions can spread very quickly, and each card uncovered brings an additional chance for a general to march closer to your defeat. Examples of Darkness Spreads cards. The top half shows color, number, and location of minions to spawn. The bottom half shows which general moves, and to where. Generals only move to the next location in their trajectory, meaning they will not move if the card causes them to skip a location. There are many ways to lose to Defenders…and only one to win. Winning is obvious, but often difficult – you must defeat each of the four generals. After the last general is defeated, the game immediately ends, so you needn’t worry about any remaining taint crystals or minions left over (they’ll provide good training material for newbies, no doubt). There isn’t any player elimination in Defenders. If your character dies, remove him from the game and select a new hero to take up the fight. You will have to discard any cards your previous character had, including quest rewards and special purple cards, since your new hero wouldn’t have access to these. So, we may or may not be surrounded here. No pressure. Minions can spread deceptively fast, so often it’s a good idea to clear out at least a few each turn, even if only on your way to complete a quest. You may want to budget extra actions in case the dice decide to turn against you, and always have a plan for escape if you can’t negate all incoming damage. Minions that spawn on your location with your pulled Darkness Spreads DO count as being there on the end of your turn, so an area full with undead can net up to four points of damage if you’re unlucky. Always keep an eye out for taint crystal and minion numbers. If either is the last pulled, you lose, no matter how close to smashing Sapphire into the ground you were. Since special cards can be played at any time, you may need to use them earlier than planned to avoid an untimely defeat at the hands of the RNG gods. Special cards are usually very powerful, and can be used at any time, even on other players’ turns. If you have a lucky run, you can try to save them to use against the generals (boxed areas), but you might not be able to resist using them in a dire situation! 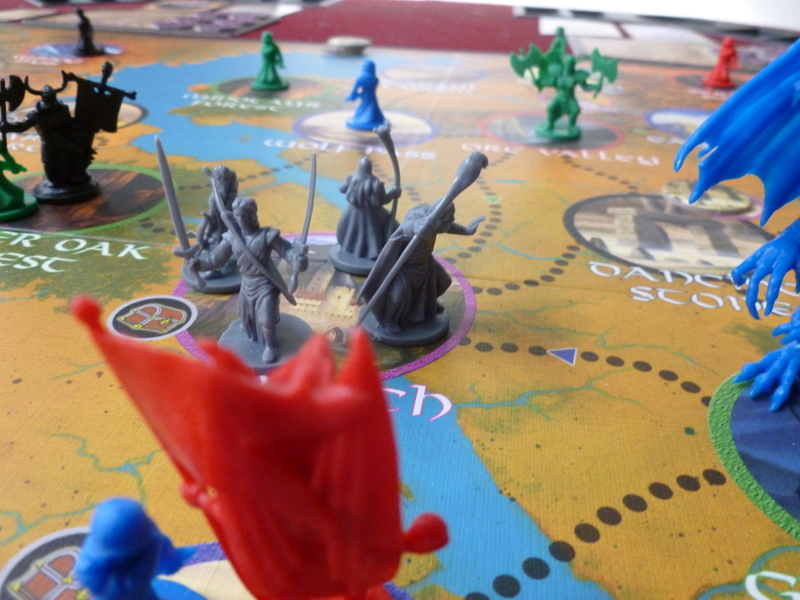 Both of us really enjoy Defenders – it was possibly our first real ‘love’ in the board game realm. That said, now that we’ve got a few more games under our belts, Defenders is really only a game we bring out by request of our friends at this point. Luck: The main issue I have is the reliance on luck. To kill minions, you need to roll a 3+ for orcs, 4+ for demons/undead, and 5+ for dragonkin. I like the idea of this (that enemies have variable difficulties), but a string of 1 and 2 rolls can leave an otherwise promising turn becoming “can I clear one area…please…?” The generals also suffer from this, albeit in a different way. To fight generals, you gather Hero cards. Since it’s a co-op, you can gather together everyone else and you can all pledge your Hero cards together to fight the generals. Usually, you have 15+ rolls and it’s a stomp, which is rather anticlimactic. Other times, you have the same amount of cards and you almost lose. Now, this can be a positive, as you never know if you’ll succeed or not, no matter how many cards you have. For me, I wish there were a way to mitigate the luck somehow so that there is actually some strategy involved instead of gather all the cards possible so that it’s almost always easy peasy. 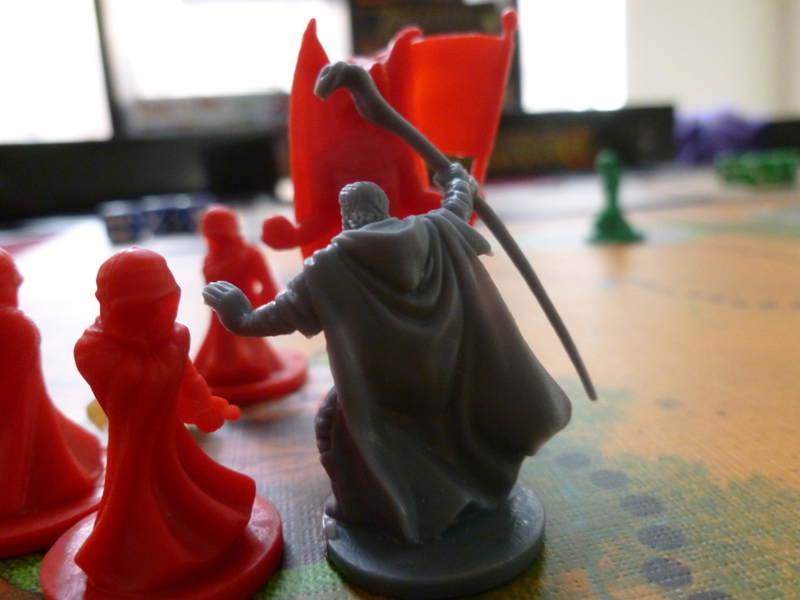 Strategy: I wouldn’t say that Defenders is devoid of strategy, however. It just seems to be guided by luck of the draw. That is to say, if you wanted to go after the dragon general first because you have the most blue cards, but the demon general (who we have no-so-affectionately nickednamed a vulgar and alliterative name ending in “face”) is knocking on your door. Do you split up and have some people go after Sapphire and everyone else go after, er, “Fudgeface?” Do you drop all your blue cards and hope to pull red instead (probably not recommended)? Do you rush quests in hopes of getting a more useful one? Visit inns? Ignore Fudgeface entirely? Similarly, it can be fun deciding how to split up everyone in order to most efficiently clear minions and taint crystals off the board, and leaves a satisfying tactical aftertaste. Just don’t assume you’ll actually get to do all your actions in your turn – leave it as a best case scenario, but don’t trust the dice to let you have it your way. An epic battle or not? Does it matter as long as Jerkface is dead? Interaction: All cards are played face up in Defenders, so everyone has full knowledge of what their allies can do at any time. Although not a problem for our particular group, I could see how, in a group with one or more dominant personalities and more passive personalities, you could have one or two people dictating what everyone else should do with their turn. In the beginning, if you are playing with less experienced people, you will almost certainly have this – but I would argue that many times this produces a mentoring effect and in the end they’ll learn what’s best to do on their turn; in fact, helping younger or less experienced players by reminding them what they can do and what would probably be best to do can be very helpful, as the game can be overwhelming with the amount of choices to make at times. That said, if your group is experienced and balanced, you will often feel like a group of adventurers working together, which is awesome. And although I’ve ragged on the fights with generals above, one of the areas I really feel they shine is in interaction. Discussing when to engage, on whose turn, and who should be the one to get the killing blow (which confers a special ability) can be fun tactical discussion. Turns can sometimes last a long time as people figure out what they want to do. However, in our group at least, turns are often discussed with each other, so everyone is engaged even when it’s not your own turn. Tactical discussions are frequent, as well as more visceral yaying or awwing when the dice roll out, as everyone is affected by your successes or failures. Given the length of the game and the amount you can get done on your turn, I would say downtime is at an impressive minimum. Replayability: With random draws dictating monster spread and when the generals advance, Defenders has a good amount of replayability. 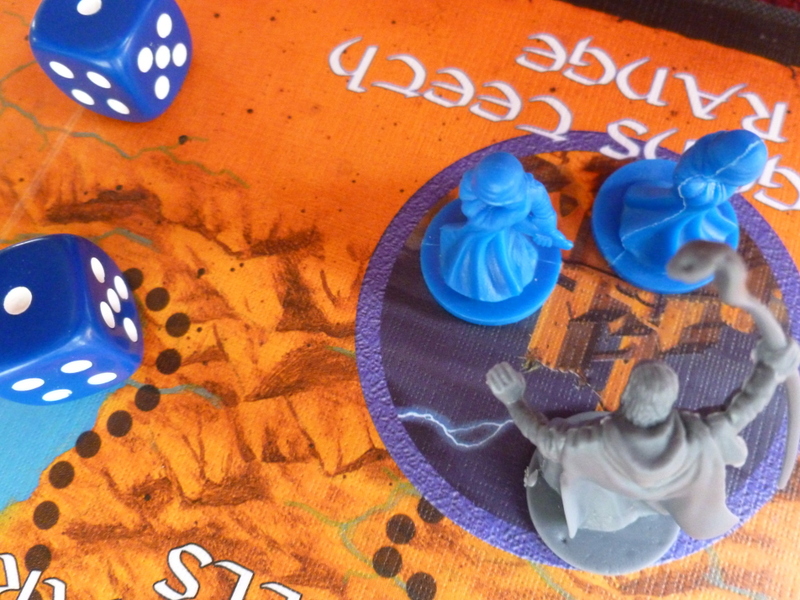 Although frustrating, games that ended quickly due to bad draws (all four generals knocking on the door within the first few turns, for example) often inspire another game in order to try to beat it this next time. Erik and I have grown a little tired of it (mostly due to the luck factor, I believe), but if you love luck I think you’ll find repeated games just as fun as the last. We have one hero expansion, and I expect the others, as well as the full expansion, add to the replayability value as well. While not canon, roleplaying with mixed genres may help your replay experience. Force palm to the face! Heaviness: I wouldn’t call Defenders a heavy or even especially difficult game, but the first few games can be a bit to digest at first. I would recommend taking things slowly, checking on rules every so often, and soon the game will come very naturally. Similarly, I think younger children can play than the box recommends (13+), but they may need a little mentoring their first few turns. 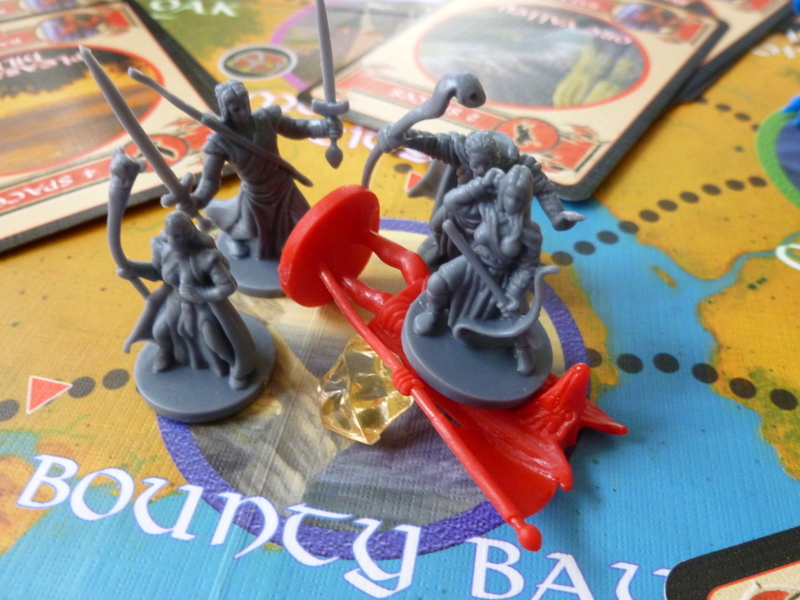 Defenders is long, however, so don’t expect a filler or even a quick game before dinner. There are some quick games of Defenders, but usually they’re not victorious! Aesthetics: Personally, I would call the illustrations a little dated. The colors are not especially vibrant (the map is primarily orangeish, with few spots of contrast) and the images are not overly dynamic. That said, they do evoke the fantasy feel well and work for the game overall. My biggest complaint would have to be the Comic Sans typeface; righteous Internet elitism aside, I don’t feel like Comic Sans really has any place in a fantasy setting. Although it is hardly detrimental, you might be sad when, upon reading over your characters abilities while waiting your turn, the text is, sadly, still Comic Sans. The typeface on the board itself is much better in terms of being fantasy-esque, though can be difficult to read at times. This may, however, lead to interesting renaming of places such as our friend who thought “Seabird Port” was “Scabiro Port,” and it has now, accordingly, been renamed as such. Component Quality: I’m very impressed with the component quality. All the cardboard pieces are nice and thick. Minions, heros, and generals all have their own minis, and though minion minis are the same for all races, they’re color-coded so it’s not a big issue. The general and hero minis aren’t top tier quality, but for the price, they are an excellent value, evoking the theme and, for the generals, being color-coded to add to the functionality as well. And, after all, should the minis not be to your liking, you can always go out and purchase nicer ones, but, for the cost, I thoroughly enjoy the provided minis in terms of promoting theme and being functional. Sapphire likes to fall over and sleep sometimes. Or maybe the Eagle Rider took her down. Yeah, we’ll just go with that. Value: Defenders can be a little pricey, but if you find it on sale or from a good store, it’s no more so than similar games of its quality and genre. We’ve gotten a good amount of playtime from it, especially in our group of four, so I’d say it’s paid for itself in entertainment value. It’s also a game I can see us keeping in our collection indefinitely and still getting play. The minis aren’t amazing quality, but are still paint-worthy in my opinion, so if you like painting minis, you’ll enjoy what Defenders has to offer as well. Overall: In all, I would say Defenders is still on Erik and my top co-op games list. Though we don’t like to play it with just the two of us as much anymore (partially due to the increased difficulty of only two characters – the game seems much more balanced for four), we still enjoy playing it with friends. Though it can drag at times and the dice rolls and card draws can be frustrating, it’s still an excellent fantasy adventure game and a good co-op. The amount of dimension it adds over games like Pandemic or Forbidden Island, which it shares some mechanics with, is worth the extra time investment, and the quality of components makes it very fun to play the game.